ORCAS ATTACK ON MOTHER'S DAY! It had already been a pretty good Mother's Day cruise on Monterey Bay on 9 May 2004. We'd seen a breaching Humpback Whale (right), plenty of Black-footed Albatross, and 3 Flesh-footed Shearwaters. The leaders on this Monterey Bay Seabirds trip — Richard Ternullo, Roger Wolfe, Steve Bailey and I — had enjoyed the sunshine and were chatting with skipper Roger Garcia when the radio crackled with news that a pod of Killer Whales were attacking a Gray Whale mother and calf just off Moss Landing, so off we headed through bouncing seas . . . This is a pictorial account of the Orcas' attack taken with a small autofocus digital camera with a 3x optical zoom [an Olympus Camedia D560]. Others aboard with larger lens — including Roger Wolfe, Jeff Poklen, Bill Bousman, and Steve Anyon-Smith from Australia — will have different perspectives; a couple of superb shots by Jeff Poklen follow my account here. Others will be on the Monterey Bay Whale Watch seabirds site. In the account that follows, the text describes the photos that are below it. As we arrived after lumbering across the Bay for an hour, we could see that the attack was taking place just a half-mile or so off the Moss Landing shore, and that researchers with Monterey Bay Whale Watch (Nancy Black and others) were already on the scene in small Zodiaks. A half-dozen pleasure craft were also nearby. The attacking pod of Orcas (also known as Killer Whales) included a big male with huge dorsal fin, several adult females, some youngsters, and at least one very small baby whale. I tried to get an exact count several times, but the best I could come up with was a pod of about a dozen. Richard Ternullo estimated 15 Orcas. The focus of the Orcas' attack was a mother Gray Whale and calf. Orcas regularly prey on Gray Whale calves during their northward migration in spring. These calves (calf is left of the mother in the following pic) were born during the winter in lagoons on the Pacific side of Baja California and are shepherded during the northbound migration by their mothers. If they survive the gauntlet of Killer Whales along the Pacific coast, they will feed and grow in the Bering Sea off Alaska this summer. The Orcas are circling them in the attack. In the next shot, you can clearly see the adult Gray Whale and her calf to her right. Because whale skin and blubber is so thick, the Orcas are not especially trying to bite the whales (although they did nip at fins and flippers). Rather, they worked on ramming the Gray Whales in an attempt to weaken them, and particularly tried to separate the calf from its mother. 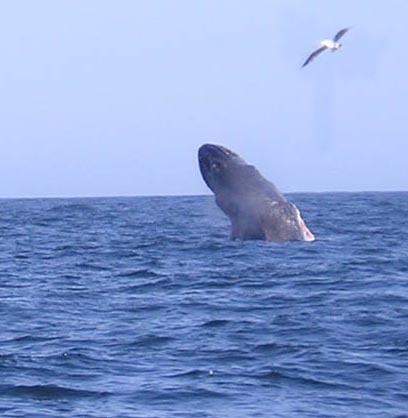 It is the calf they are after; killing an adult Gray Whale is rare. But calves — if weakened and separated from the protecting mother — can be drowned and the tongue then eaten. ... and then ramming into the Gray Whales, again and again. ... or many try to get on top of the mother and calf and force them under water and apart. The mother Gray Whale counters by rolling her baby on to her back so it can breathe, and by trying to keep herself between the attacking Orcas and her baby. The attack had been going on for over an hour when we arrived, and it continued for another hour while we watched. The huge male "supervised" but apparently was not one of the direct attackers. Rather, again and again it was the large female Orcas that led the attack. This is a big female right on top of the Grays. The other thing the mother Gray Whale did was to swim steadily towards shore when there was a break in the attacks. If she can get into shallow enough water, perhaps she and her baby will escape. Orcas prefer to stay in deeper water. We followed as the Gray Whales maneuvered towards shore. As the depth finder showed us leaving the canyon, and coming up on 60 foot depth on the shelf, the Orcas suddenly broke off their attack. They regrouped and headed out to sea. The mother and calf Gray Whales escaped towards shore. We saw the big male racing away with his harem due west; it was quite an effort to catch up with them once more as the Orca pod sped away towards the deep. With the ship bouncing crazily and the spray flying, I didn't get the final snap of the Killer Whales heading to sea. They will hunt again and will likely succeed next try. But from a very human perspective it seemed somehow fitting that on this day — our Mother's Day — that the mother Gray Whale would successfully defend her calf from the "wolves of the sea."